Do you believe there will be a new generation FE alongside the ME? View Poll Results: Do you believe there will be a new generation FE alongside the ME? I'm not buying it personally, but there seems to be a group that feels strongly there will be both a FE and ME simultaneously. Let's see some numbers with votes, and this only applies to next gen, as I do think it's a plausible idea down the road but not anytime soon. No. The C8 will replace the C7. That’s the way it works. 7 replaced, 6, 6 replaced 5, 5 replaced 4... And, the C8 is the ME we see running around in camo. All of the engineering dollars are committed to the ME, and I see no scenario in which Chevrolet would invest in both the new and old platforms while GM is moving forward with new technologies like EV and autonomous vehicles. Also, there have been no rumors or sightings of FE mules running around, which there would be if Chevrolet was creating the 7.5 with DCT, coil over shocks, and even the C8 interior that some on here are imagining. The only scenario that could possibly exist along these lines is that the C7 continues in production alongside the C8, but I HIGHLY doubt that will occur. There's no precedent, has 2 generations of the Corvette EVER been produced simultaneously? If there are C7.5 mules running around with coil overs, a DCT and a LT2, but still sporting C7 body panels, how would you know it's a C7.5 mule and not a normal C7? None of those items are apparent by just seeing one driving around. Absolutely nothing to make you think you are not seeing a stock C7. I just thought it'd be interesting to see how many people actually believe it since it's discussed so often lol. Not surprised by the results so far. Good point, you are correct. However, if they intended spend the money to revamp the C7 FE to sell next to the C8 ME, I would expect that Chevy would make more significant changes than just the chassis and drivetrain. It seems like something would have leaked out by now in some fashion. I wish there was a more affordable 2 seater from GM. Remember the Solstice/Sky? I’m guessing they assume we’d settle on a Camaro since the backseat is worthless anyway. By now, it's just stupid to even post such a silly thread. I'm resigning myself to the fact that GM is going to kill the car that has been an American icon just to make some european exotic wannabe, and we're seeing the end of automotive history. I don't see the Corvette being around after the C8. See it's only 10% (as of this post) that think GM, with all the things they have to worry about, is going to waste money, time and engineering resources messing with keeping a FE Corvette with an old technology, large cid engine in the face of the fast moving car world going (unfortunately) to EVs! There will be several variants of the C8 and some including what an "insider" Andy Pilgrim "purposely leaked," i.e. a variant will have an electric motor/generator hybrid driving the front wheels. As I suspect, since others are going in that direction, it will be a short duration system with a light weight battery. That will also recover some of the 1/3 energy that even gets to the rear wheels that is wasted braking! One may include a smaller ICE with a turbo to use some of the ~30 energy wasted going out the exhaust. Some don't care about mpg (including me) BUT it's GM meeting a corporate mpg goal. They worry much more about the 585,000 Silverado's sold in 2018 than spending money screwing around with a FE Corvette! Last edited by JerryU; 03-25-2019 at 09:42 AM. Although I don't see anything close to a ~$25,000 price point, one variant could be in that car class! They could introduce a C8 model with the Silverado's 2.7 Liter double overhead cam, 4 valve/cylinder turbo with it's 310 hp and that Andy Pilgrim announced FWD electric motor/generator hybrid! Might be able to get what some of us would like, a lighter weight Vette! Loved my modified '67 Corvair (14 inch wide tires, headers etc) as well as my Datsun 260Z. Both weighed ~2500 lbs! Can't get to that weight but sure could get closer than a heavy C8! Last edited by JerryU; 03-25-2019 at 07:51 AM. I'd love to see GM have another try at an American Miata like the Solstice, but that's not what a C8 + I4 turbo would be since it would still carry a structure engineered for over 500 horsepower/torque. Unfortunately the days of automakers selling multiple lines of affordable sport coupes are gone. We'll be lucky to see another Camaro generation. The problem isn't EVs - electric motors are fantastic street motors with gobs of low end torque - the problem is that fat Americans, bad roads, and a shrinking middle class have conspired to drive demand of SUVs in lieu of less practical sports cars. Last edited by Zaro Tundov; 03-25-2019 at 08:56 AM. GM is not going to make a new light weight frame, use different light weight cradles or suspension components. 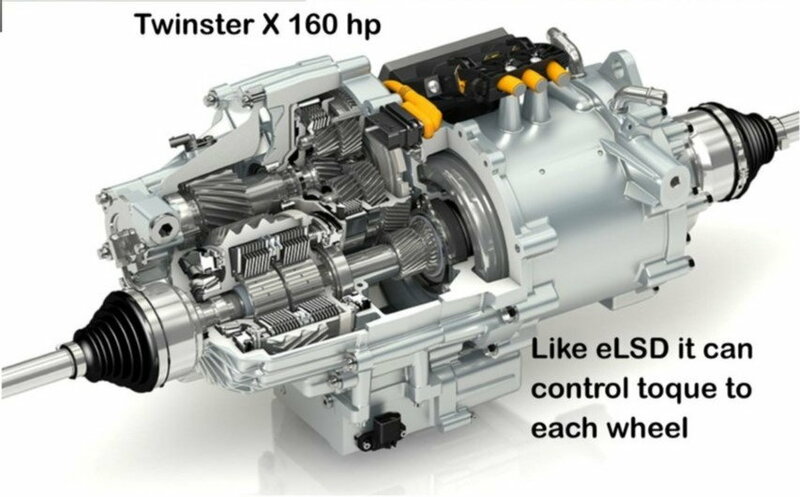 With the two speed (pic below, already being tested) two axle drive motor/generator they could use a light weight short duration hybrid system and get double the torque when driving “in anger.” So 310 hp ICE with a ~160 hp equivalent electric drive with 2:1 gearing gets a short term ~320 hp equivalent extra short term torque. That’s a total of 640 hp equivalent torque when desired, i.e. when accelerating and coming out of a turn. When cruising and for EPA defined mpg test, use the electric drive with energy stored when braking, and turn on the ICE when you reach cruising speed. Much easier sad than done but as my old boss would say when he popped out and idea like that- Or Something.” He was a brilliant Physicist that was in charge of 4 R&D Labs, including mine. However had to remind my folks that they should NOT just blindly try to follow an idea he thought of in a few minutes. He pays us to consider viable options that will work in the real world! Last edited by JerryU; 03-25-2019 at 09:34 AM. Kudos to OP on this simple poll. I'm shocked no one has thought to do this before now, including me. With the dozens and dozens of repetitive posts by a very small vocal minority, it was easy to lose sight of how overwhelmingly large the majority is, who think a dual, new-gen, ME and FE offering is not rational. Last edited by Foosh; 03-25-2019 at 09:32 AM. Eh, give me one for the low-mid 30's then, I'd still swing that. I do wonder how much weight you could trim from a production Vette though, get rid of all the comfort features, give it some lighter seats and strip it down to a basic nav/stereo system. The problem isn't EVs - electric motors are fantastic street motors with gobs of low end torque - the problem is that fat Americans, bad roads, and a shrinking middle class have conspired to drive demand of SUVs in lieu of less practical sports cars. I still don't think the SUV trend has that big of an effect on sports cars. Sedans, yes, I'm just not buying that that many people cross shop an SUV and a Vette the way they would a Cruze and Equinox. Quick Reply: Do you believe there will be a new generation FE alongside the ME?